Frontier Roofing uses high-quality products at affordable prices. Each of our roofing vendors provide manufacturer warranties on their roofing materials. In conjunction with our manufacturers' warranties, we provide a Frontier Roofing services, installation and repair guarantee. Frontier Roofing promises that all of our roofing services, installations and repairs will meet your satisfaction. When you hire Frontier Roofing as your roofing contractor, you can rest assured that your leaky roof will be fixed. We guarantee our work. Here's a little information regarding a few of our trusted vendors and their quality products. At Frontier Roofing and Construction, we guarantee quality with FelTex® underlayment for your roofing needs. FelTex® is stronger and more durable than 15 or 30 lb. felt. FelTex® resists water and mold growth, which is important here in the Northwest, and will not rot. FelTex® is a synthetic roof underlayment, superior to its competitors, and is recognized for its exceptional strength, durability and performance. FelTex® will not buckle, warp or crack. Left exposed, FelTex® can protect a roof up to six months. FelTex® is rated for commercial and residential applications and is an ideal underlayment for asphalt, shingles, metal, tile, slate, and a variety of sloped roofing materials... with FelTex® you'll always receive quality. Capital 30 Hybrid Underlayment is just that, a hybrid of both asphaltic polymers and synthetic fabrics. Capital 30 Hybrid consistently out performs organic 30 lb. felt underlayments. It is water resistant and left exposed can protect a roof for 4 months. Capital 30 Hybrid will not stick to metal roofing with stability up to 260 degrees Fahrenheit. 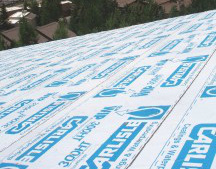 Carlisle Water and Ice Protection WIP® is the perfect underlayment to protect your roof from bad weather while roofing. At Frontier Roofing, we use several types of Carlisle Water & Ice Protection underlayments when needed to safe-guard your home. Carlisle Water and Ice Protection is one of the quality products we use to roof during rainy days and winter months to maintain a leak free roof. At Frontier Roofing, we use several trusted CertainTeed products, including CertainTeed's Winterguard waterproofing water and ice underlayment, CertainTeed Asphalt Shingles and CertainTeed Torch down flat roofing sealant. CertainTeed Winterguard is a waterproofing shingle underlayment to protect against water penetration in the vulnerable places on your roof. CertainTeed's Winterguard is a composite of asphalt material. The asphalt makes it vapor-tight, and the polymers make the asphalt elastic and sticky. This elasticity and stickiness is beneficial because the material will stretch and seal around roofing nails. CertainTeed Asphalt Shingles come in a variety of styles and colors. You can choose from Luxury, Premium Designer, Designer or Traditional shingles. Prices and warranties vary by selection, but all are durable and protect your roof. CertainTeed Torch down roofing is designed for low-slope or flat roofed structures. Only certified and qualified roofing contractors are allowed to install Torch down flat roofing material. Frontier Roofing is qualified and certified with CertainTeed as an authorized installer for flat roof and low-slope structures. Made from modified bitumen membranes, this material combines a mat made from non-oxidized (flux) asphalt, blended with various thermoplastic atactic polypropylene polymers and co-polymers to protect with high performance on low-slope or flat roofs. CetainTeed Torch down roofing is the perfect selection for residences or businesses with low-slope or flat roofed structures. Call for a free estimate.